In 1973, Swedish government believed that most allergies were caused by wall to wall carpet in the home. In a case of bureaucrats out of control, carpet was banned from public facilities for the next 17 years throughout the country. Carpet sales plunged as people pulled up their flooring and replaced it with wood and synthetic flooring. Follow-up studies by the Swedish Central Statistics Bureau indicated a dramatic increase of allergy cases following the carpet ban and replacement frenzy. As carpet was removed and hard surface flooring was installed, the incidence of allergy increased by 600% among the Swedish population! This alarming increase was in direct proportion to the amount of hard flooring materials installed and contributes to defeat a common misconception - Removal of carpet does not improve the rate of allergies. The key is regular cleaning of all home furnishings including carpeting, furniture upholstery, tile and wood flooring and mattresses. Allergies are a growing problem with an estimated over 40 million Americans suffer from allergies due to poor home indoor air quality. Many studies have revealed that the cause of many allergies is airborne particles in the home. A typical home has many forms of these allergens floating around including dust, pollen, chemical emissions, pet dander and mold spores. Just by opening the door to go outside you are inviting these unwelcome guests into your home. The fact is that your carpeting is the biggest filter in your home. As airborne particles fall from the air, they land in the fibers of the carpet and remain there until vacuumed. In contrast, hard surface flooring allows allergen causing agents to be stirred up until they become airborne once again and increase the risk of being inhaled by your family. Next to second-hand cigarette smoke and cooking emissions, house dust re-suspended by indoor human activity is the largest source of particulate matter that we breathe. The IICRC also found that carpet often improves indoor environmental quality by trapping and holding particles, dust and other soils until routine maintenance and professional cleaning can remove them. But if neglected, carpet, like any container, can become filled to the extent that it can hold no more. At that point when walked upon, it will become a releasing source for particles and dusts that can cause respiratory irritation or trigger allergies. So what can you do to improve your indoor air quality? At good place to start is to vacuum frequently and have your carpets professionally cleaned at least once a year is a good start. Other areas to have professionally cleaned on a set schedule are your furniture and especially the mattresses on all your beds. 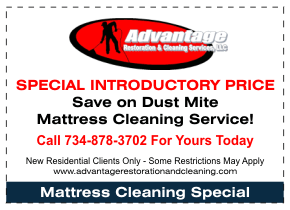 Mattress dust mites are a common irritant to many people that suffer from allergies. A trained professional can clean it to eliminate these microscopic creatures that live in the fibers of your bed. They don’t actually bite but they are irritants that can trigger your allergy symptoms. There’s only one way to get rid of these creatures; destroy and remove them. This can be accomplished by professional mattress cleaning and sanitizing from Advantage Restoration and Cleaning. They have the knowledge, tools and techniques to get thoroughly clean your mattress to help alleviate the problem. Call them today at 734-879-3702 to learn how to get rid of those pesky critters. Click here to schedule your appointment online today. Mattress Dust Mites: Are You Sleeping with the Enemy?